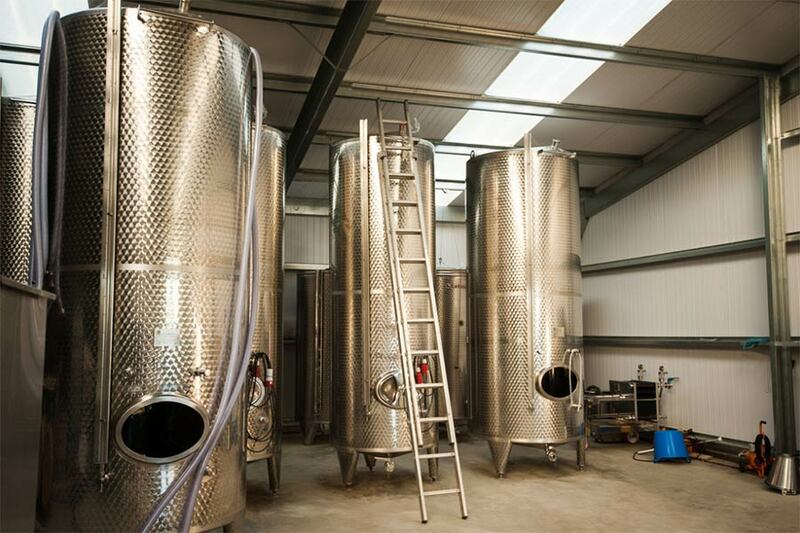 Blackdown Ridge Estate’s purpose-built winery, with the capability to produce up to 30,000 bottles is ready for the 2018 harvest and production of our still and sparkling wines. As harvest approaches, regular sampling and observation ensures that when the grapes are plump, ripe and full of delicious varietal flavours, our expert winemaker can choose the perfect moment to begin the harvest. Ripeness is vitally important to winemakers. They need enough sugar in the grapes to convert into alcohol, but not so ripe that there is insufficient acidity. Sugar ripeness is not all, there should be optimum tannin and flavour compounds. The care of the vines leading up to picking and the precise timing of harvest are all important. The grapes travel in 20kg crates to avoid any premature squashing.The winemakers first decision is to destalk or not, this depends on the elements he wants to create in the final product. As the grapes arrive at the Winery a careful blend of science and magic begins. Our white and rose varieties are then gently pressed in our pneumatic press to minimise the extraction of undesirable colour and tannins, only releasing the grape juice, known as the ‘must’. The fresh must is moved to our stainless steel tanks for fermentation, transforming the natural sugars of the grape into alcohol. They will remain in the tanks until they are filtered, blended and bottled several months later. Grapes intended for red wines undergo a slightly different process where, once destalked, they are transferred to open-top fermenters. Fermenting the juice with the skins allows for all the distinctive flavour and colour components of the skins to be released. Maintaining temperature control is key – too cold and the yeast won’t work, too hot and the fermentation will run too fast and possibly get stuck. Once the tannins and flavours are ready the skins are removed through pressing and malolactic fermentation starts, transforming tart malic acid found naturally in the fresh grapes into softer, rounded and more desirable lactic acid. Racking the wine into small oak barrels for the remainder of the process allows the red wine to age and develop, and regular tasting and careful blending ensures that the result is a truly well-rounded and quality tested example of English wine. From the very beginning, we have tried to follow a sustainable and minimalistic philosophy at Blackdown Ridge. To achieve this, we take a minimal intervention approach in the both the vineyard and the winery.